Daniel Nash of the Issaquah Reporter wrote a great article about the opening of the new Cougar/Squak Corridor Park and discussed how Dave Kappler of the Issaquah Alps Trail Club and our grassroots organization, Save Squak, were instrumental in stopping the proposed logging of Squak Mountain and sparking the creation of this new park. In November 2012, Kappler found out from others in the community that the old Issaquah Highlands Recreational Club had been purchased by Erickson Logging Inc.
Over the subsequent half-year, the company applied multiple times with the state Department of Natural Resources to harvest the land’s timber, some of which were accepted. However, the Trails Club and grassroots organization Save Squak continued to lobby King County to purchase the land. The county didn’t have immediate funds to purchase the land, but the club and Save Squak attracted the attention of the Washington Trails Association and The Trust for Public Land. The Trust for Public Land eventually made a deal in July 2013 to purchase the land on behalf of King County for $5 million. King County acquired the land in December 2014 after completing repayment to The Trust for Public Land. Read the full Issaquah Reporter article by clicking here. Don’t Miss It This Saturday! Join Save Squak, Issaquah Alps Trail Club, King County Parks, REI and Your Neighbors to Celebrate the Grand Opening of Cougar/Squak Corridor Park! Join the Issaquah Alps Trail Club, Save Squak, Trust for Public Land, Washington Trails Association, Mountains to Sound Greenway Trust, the Nature Conservancy, King County Parks, REI and other organizations for a celebration of National Trails Day, at the grand opening of Cougar/Squak Corridor Park. Festivities begin at 9:30 a.m., and include an open house, plus a guided tour of a new hiking trail. 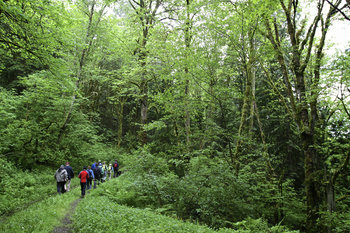 After a grassroots effort of area residents who formed Save Squak, led by Dave Kappler of the Issaquah Alps Trail Club, the proposed logging of Squak Mountain was averted when King County purchased 226 acres in the valley between Cougar and Squak mountains in 2014, with the help of The Trust for Public Land. The new acreage has been added to existing public lands and creates a 730-acre Cougar/Squak Corridor Park that protects the headwaters of a salmon-bearing stream, and features deep forests, hiking trails and more. King County Parks employees and volunteers have been busy preparing the new acreage for public use, including removing unwanted invasive vegetation and building new trails. The park is located at 10610 Renton Issaquah Rd. SE, Issaquah. The June 6 open house features representatives from Washington Trails Association (WTA), Mountains to Sound Greenway Trust (MTSGT), The Nature Conservancy, The Trust for Public Land, and REI. Visitors will be invited to explore the lower portion of the park, tour Cougar/Squak Lodge in the park, and join guides from the Issaquah Alps Trails Club on a hike along the new Margaret’s Way Trail – a new, 2-1/2-mile-long trail that connects to trails in Squak Mountain State Park. Stop by the Issaquah Alps Trail Club table and meet the folks who led the grassroots effort to stop the proposed logging of Squak Mountain and worked with the Washington Forest Law Center to challenge the logging permits until King County Executive Dow Constantine along with Council members Reagan Dunn and Larry Philips could act. Built by local volunteers working with WTA, Student Conservation Association, AmeriCorps NCCC – Gold 7 and a King County Parks backcountry trails crew, the new trail honors Margaret MacLeod, a park planner for numerous local, state and federal agencies, whose long career resulted in the preservation of hundreds of acres of acres of land along Issaquah Creek and the Squak and Tiger mountain uplands. Other activities include two “Ivy Out” events to dig out invasive ivy, coordinated by MTSGT and Seattle Works, plus an opportunity for family and youth to help WTA volunteers build trails. King County Parks has begun a community engagement process to gather ideas from the public about uses and amenities at the park. Parks employees are working with a steering group and will host two community meetings on later this spring in Issaquah. “Save Squak” Deal Inked Between Logger and King County Park and Trust for Public Land. Founders of Squal Conservation Effort Push King County Voters to Fund Deal by Renewing August 6 King County Parks Levy. We are pleased with the announcement that the Trust for Public Lands and King County signed a purchase and sale agreement with the owner on July 18th for 216 acres of forest land on Squak Mountain located in the Mountains to Sound Greenway view corridor along State Route 900 in King County’s unincorporated Issaquah. This agreement is the first official milestone in bringing this land, slated for a clear cut logging operation, into public ownership where it will be preserved as public forest, wildlife habitat, parks, recreation and open space. The 216 acres will be purchased for $5 million, with funding assistance provided to King County by the Trust for Public Lands. King County will use parks levy funds such as the King County Conservation Futures to secure this purchase. Renewal of the King County Parks levy on the August 6th primary ballot will be absolutely critical as a fundraising source to close this purchase and ensure monies are available to purchase other conservation land. The Washington Forest Law Center (WFLC), representing the Issaquah Alps Trail Club (IATC) and grassroots citizens activist group Save Squak, on May 23, 2013 filed a comment letter with the Washington Department of Natural Resources in opposition to the newest Erickson Logging permit application. Erickson’s new application attempts to use a legal sleight-of-hand to avoid regulatory oversight by transferring ownership of the forest parcels to a newly formed limited liability corporation (LLC) that he claims is not an industrial logging operation. This is a clear end run around the protections in the law and forest management regulations since Erickson is the sole owner of the new LLC and there is no real difference between it and his existing industrial logging operation. He now claims to be a “small forest landowner” under the guise of the this new company and thus exempt from regulatory protections of the endangered marbled murrelet habitat. Click here to download our full comment letter along with all exhibits and maps. SQUAK MOUNTAIN STILL IN DANGER: LOGGER REFILES PERMIT UNDER NEW NAME IN AN APPARENT ATTEMPT TO DODGE ENVIRONMENTAL REGULATION. On May 8th, Kurt Erickson refiled a permit application with the Washington State Department of Natural Resources to clearcut 96 acres of old forest, even though a similar application was recently blocked to protect habitat for threatened wildlife. Mr. Erickson’s new application seeks to take advantage of an exception to state law that allows “small forest landowners” to log otherwise protected old forests. While that exception is intended to benefit family foresters who rely on small forest holdings for their livelihood, Mr. Erickson owns hundreds of acres of forests throughout Washington State as well as a major timber harvesting operation. Mr. Erickson previously conceded his status as an industrial forester when he recently applied for a permit to log the very same property as a large forest landowner. Since withdrawing that application, he has transferred ownership of the Squak Mountain property to a new corporate entity with no other timber holdings. Under that new name, Mr. Erickson now seeks to take advantage of the “small forest landowner” exception to log the approximately 100-year old trees on Squak Mountain. The forest at issue provides suitable habitat for the threatened marbled murrelet and is part of a wildlife corridor between the popular Cougar Mountain and Squak Mountain State Parks. The timing for this maneuver raises further alarms, as also on May 8, King County Executive Dow Constantine held a press conference to announce a preliminary purchase agreement between King County, the Trust for Public Lands and Kurt Erickson for 216 acres of property on Squak Mountain, including the area proposed for clearcut. If Kurt Erickson’s Forest Practice Application for this acreage is granted approval, a precedent would be set that would have statewide significance for the logging industry and environmental protection. Huge corporate forest owners could simply divide their land up into multiple corporations and claim status as small forest landowners to avoid environmental regulation. State law allows small forest landowners to log otherwise protected wildlife habitat, and also requires smaller buffers around fish-bearing streams. Reduced buffers increase water pollution and reduce protections for spawning salmon. Widespread access to small forest landowner exceptions would not only have severe impacts to wildlife, clean water, and fisheries, it would disadvantage legitimate small forest landowners. While King County, the Trust for Public Lands, and Kurt Erickson continue to negotiate a sales price, which they hope to conclude by June 21st, our efforts to fight the approval of Erickson’s latest permit will continue in earnest. We will formally launch our fundraising plans to ensure the greatest level of support for the King County Park levy on the upcoming August 6th ballot. We encourage everyone to loudly and immediately make their objections to the approval of FPA #241- 6123 part of the public record prior to the decision date of June 7th, 2013. To do so, please email Bruce McDonald, DNR Forest Practices at Bruce.McDonald@dnr.wa.gov. You should also state your objections to King County Executive Dow Constantine at Dow.Constantine@kingcounty.gov and King County Councilman and our #1 publicly elected supporter, Reagan Dunn, at Reagan.Dunn@kingcounty.gov. We also encourage everyone to question the legality of Erickson’s “small forest landowner designation” by contacting the office of Washington State Attorney General Bob Ferguson’s office, which you may do by calling (360) 753-6200 or submitting an online contact form which may be found at https://fortress.wa.gov/atg/formhandler/ago/ContactForm.aspx?subject=Natural%20Resources. The Issaquah Alps Trails Club (IATC) formed in 1979, is an Issaquah-based not-for-profit recreation and conservation group devoted to hiking, establishing and improving trails, and advocacy for open space protection in central King County. The original focus of IATC was directed towards Cougar, Squak and Tiger Mountains, also known as the “Issaquah Alps.” In 1990, the Issaquah Alps Trails Club organized the first ‘Mountains to Sound March’, a hike from Snoqualmie Pass to Elliott Bay in Seattle, to publicize the need to preserve a scenic greenbelt connecting Seattle to the Cascade Mountains. Following this march, the Mountains to Sound Greenway Trust was founded by regional leaders. IATC leads over a hundred hikes a year in the Greenway and works on acquisitions and planning throughout the Greenway. However, the focus of IATC’s efforts remains directed towards conservation and the establishment of hiking trails in the “Issaquah Alps.” David Kappler is the President of IATC. Save Squak, a group of concerned neighbors and community supporters in Issaquah, May Valley, and throughout Greater Seattle, was established in November 2012, to find an alternative to the environmental impact of clear cut logging planned for 216 acres on Issaquah’s Squak Mountain. With the leadership of David Kappler, the group has focused its efforts on ways to bring this land into public ownership, working with King County and other conservation groups to acquire this pristine forest acreage and add it to King County Parks. The Washington Forest Law Center is a non-profit, public interest law firm dedicated to providing legal services to organizations that monitor and protect the Pacific Northwest’s private and state-owned forest lands. The Washington Forest Law Center, which represents the Issaquah Alps Trail Club and Save Squak, filed our formal opposition to the new Erickson logging permit with the Department of Natural Resources on Tuesday. The WFLC is a non-profit, public interest law firm dedicated to providing legal services to organizations that monitor and protect the Pacific Northwest’s private and state-owned forest lands. In our opposition, we also note that the parcels for the proposed clear cutting should be reclassified due to a current permit pending for subdivision development and Erickson’s own statements that he may develop the property after logging. This is grounds for moving oversight of the property from DNR to King County. We have the letter and supporting exhibits here online. Both are available in PDF format and available for reading online here. Read the first March 11 comment letter and exhibits in opposition here. Breaking News: Erickson Logging Withdraws Permit Application! Erickson Logging has withdrawn its application with the Department of Natural Resources to clear cut Squak Mountain. This follows a citizen outcry, with hundreds of opposing comments flooding DNR, capped by the detailed letters from the Washington Forest Law Center and King County agencies filed earlier this week. Withdrawal of the permit application does not mean Erickson Logging is prevented from refiling it, so victory here is not guaranteed. Currently as a result of our field inspections the landowner has agreed to withdraw the application or the Department will disapprove. Therefore we are not going to schedule an ID team at this point for FPA 2415960. More details to follow as we learn more. The Washington Forest Law Center, a non-profit, public interest law firm dedicated to providing legal services to organizations that monitor and protect the Pacific Northwest’s private and state-owned forest lands, has stepped forward to represent the Issaquah Alps Trails Club and grassroots citizen group, Save Squak. On Monday, March 11, 2013, the Washington Forest Law Center sent a letter to the Washington State Department of Natural Resources strongly opposing the proposed permit by Erickson Logging to clear cut portions of Squak Mountain at the headwaters of May Creek.